(As far as I can see from the web page above, what is missing from our set is the Histoire naturelle des poissons, which was not written by Buffon anyway, but by the Comte de Lacépède, who also wrote the volumes about snakes, which we do have). Many probabilists know Buffon for his annoying habit of dropping needles on the parquet, and finding the value of π after doing this sufficiently many times. 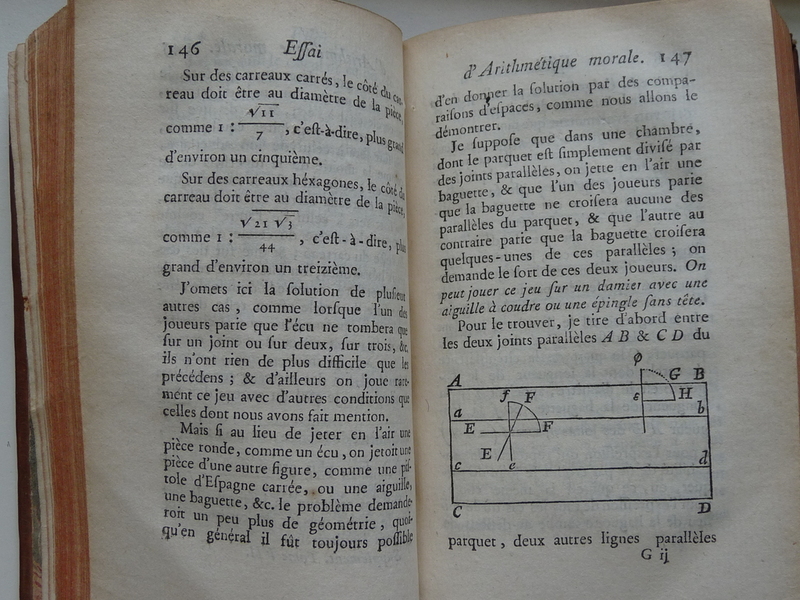 This game was indeed included in his natural history, more precisely in the Essai d’arithmétique morale (or “Essay of moral arithmetic”) in Volume VII of the Suppléments — at least, it is there in my family’s edition, though it is missing from the web site containing Buffon’s works, where the Essai is in Supplement volume 4. Notice the delightful typography and orthography: the “s” that looks like an integral sign (and is barely distinguishable from an “f”), the way the past tense is written demanderoit instead of the current demanderait, etc. “demanderait” or “demanderoit” is a “conditionnel”, not a past tense. But the “oi” does appear in many other places instead of “ai”, not only in the conditional tense. 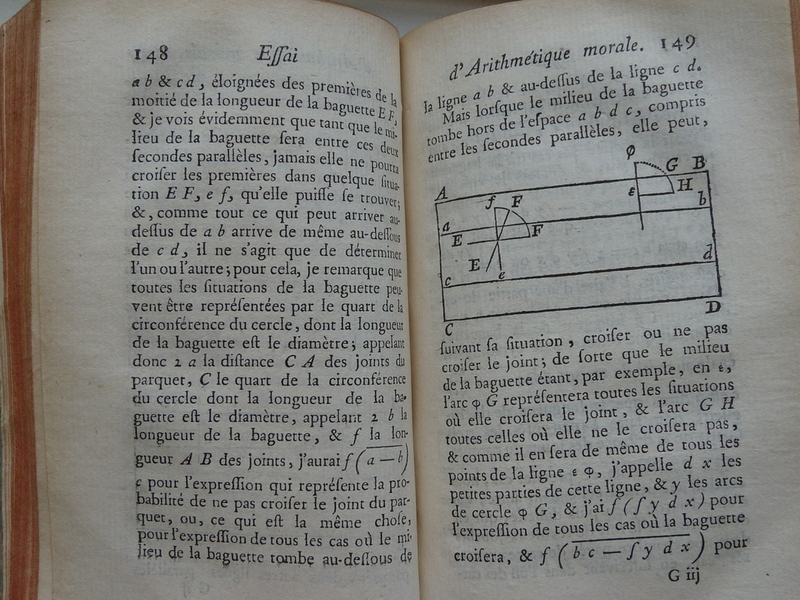 Although I don’t see any in the two pictures above, I’ve just looked in the same volume and found “connoissons” instead of “connaissons” on page 157, “étoit” instead of “était” on page 60, etc. (On the first picture above, on may also notice “héxagone” instead of the current “hexagone”). By the way, how come you know English so idiomatically? And why do you spell “kowalske” in the comment section? > By the way, how come you know English so idiomatically? > And why do you spell “kowalske” in the comment section? That was actually a bizarre setting of the ETH blog software; I think it’s changed now to something more functorial.